The number of cyclists killed or seriously injured because of Britain’s badly maintained roads has more than trebled since 2007. But campaign group Cycling UK believes the statistics do not tell the full story because they only cover incidents where police attended the scene – and not all cyclists report injuries to the police (reported the BBC on 16 March). “Cycling UK is incredibly concerned to see what is clearly a trend on the up showing more people being killed or seriously injured while cycling, all because our roads are in a shocking state,” said campaigns director Simon Jones. Hornsey and Wood Green MP Catherine West told BBC News that funds earmarked for HS2 should be raided to fix roads. She said the government would never be able to meet its clean air targets unless it made cycling to work safer for people living in “big cities”. Given all the fuss about Birmingham “council cuts” and “cycling expenditure only benefits young white men”, has the authority really hired a PR firm to promote a bizarre geek-oriented “Cycle Challenge”? City cyclists have taken over Birmingham’s roads as part of the Birmingham Cycle Revolution September Cycle Challenge, which is on track to log over 5,000 cycled journeys in September. Birmingham commuters abandoned their cars in a bid to clock up the most BikeMiles and top the September Cycle Challenge leader board. Since September 1, cyclists have logged over 3,500 journeys with more journeys being cycled daily in the run up to World Car Free Day on September 22. Businesses can still register for the challenge which is running throughout September and take the opportunity to top the September Cycle Challenge leader board and be Birmingham’s leading cycling business. Birmingham organisations including Brindleyplace, Birmingham’s Children Hospital, Millennium Point and Aston University, have embraced the cycling project and inspired their employees to sign up to the challenge to go head to head to win rewards, vouchers and discounts. Speaking about the September Cycle Challenge, Sara Wilkes, Energy, Environment & Sustainability Assistant at Aston University said, “Birmingham Cycle Revolution is a great initiative for the city and we’re excited to be taking part in the September Cycle Challenge. Businesses involved in the challenge signed up to Birmingham Cycle Revolution’s recently launched Birmingham Cycle Rewards website, birminghamcyclerewards.com, and PleaseCycle app and encourage employees to log BikeMiles and earn rewards as they cycle. During the challenge, users log their journeys through the PleaseCycle app which uses a GPS tracking system to accurately record the route the cyclist has taken. The data is then automatically uploaded to the Birmingham Cycle Rewards website where BikeMiles are saved and can be converted into rewards. The free PleaseCycle app provides users with practical fitness tips and allows them to see how many calories they have burnt and how much money they have saved by cycling. Users can also run challenges between colleagues and friends and use the website’s leader boards to track who is cycling the most. The Birmingham Cycle Revolution project aims to encourage cycling through a raft of improvements and initiatives. A target has been set to increase cycling to account for 5 per cent of all journeys in the city within the next 10 years and for cycling to represent 10 per cent of all travel by 2033. Pushbikes are a low-impact and efficient means of local transport, but on-road cycling in Birmingham is a risky and intimidating experience. Could Birmingham city council’s Cycle Revolution deliver a “step-change in levels of cycling in the city”? A key feature is the creation of a wider network of cycle routes, incorporating upgraded sections of canal towpath. However, it is far from clear that the works proposed could produce a functional cycle network consistent with the “step-change” aspiration. As ‘strawbrick’ commented, canal towpaths are generally spaces shared with pedestrians. Much of the Cycle Revolution towpath network is unlikely to be suitable for anything other than recreational cycling. It could not handle the intensity of traffic seen on (for example) the Bristol Bath cycle path in Fishponds. In the planning of the Birmingham Cycle Revolution, there seems to be a gulf between aspiration and capability. In December 2013, Birmingham city council announced plans to improve canal paths, in support of its Cycle Revolution. Under the canals element of the programme, 30 km (almost 19 miles) of towpaths would be upgraded to provide a smoother ride for bikes, while improved lighting, new access points to the cycle network and better signage are due to be introduced too. The work would be carried out on behalf of the city council by the charity Canal & River Trust. CRT’s project manager for the Birmingham Cycle Revolution was good enough to provide the following information. Our project is funded by the Department for Transport, with the funds being administered by Birmingham City Council (who have funds for other works outside the CRT remit) to resurface a total of around 25 km of towpaths, plus the improvement of a number of access points to the canal and the installation of at least 2 new ones. The areas of work covered by the project were jointly proposed by BCC and CRT and we began in January with the resurfacing of 2 km of the Birmingham Main Line Canal towards Winson Green. Since then we have completed 3 km on the Birmingham & Fazeley canal from close to the NIA out to the M6 Spaghetti Junction, along with approximately 4 km of the Worcester & Birmingham Canal from King’s Norton towards Birmingham city centre. Other areas of resurfacing work currently underway include the completion of the W & B Canal to Granville Street, further lengths of the B & F Canal from under Spaghetti Junction towards Minworth and we plan to commence works on the GU from Fazeley Street to the Ackers in the coming month or so. […] There are no plans to install new lighting along all of the towpaths, but we do hope to be able to improve some existing lighting around the Gas Street Basin area. You also asked about smoothing over canal bridge surfaces – this is not something covered by the project, as many of our foot and basin bridges in the Birmingham area have brick paved surfaces, some of which are of heritage value and can’t be altered without good justification and a sensitive solution. In Birmingham’s depths of winter, it gets dark about 4.30 pm, so the lack of lighting is obviously going to be a significant obstacle to using towpaths to encourage active travel. The lack of cyclable surfaces on canal bridges is also a big minus. No-one wants to keep getting on and off their bike at every bridge they come to. Another problem on the Birmingham canal network is poorly implemented anti-motorbike access railings. In some cases, these make bicycle access difficult. Councillor Deirdre Alden has responded to criticism of her comments about cyclists, saying that she is “not an idiot”, Cycling Weekly reported. […] “These grants have to be spent by a certain time of else the money is rebuked. Therefore decisions are rushed and rushed decisions are not always the right decisions. Is it true that cyclists are predominately young white men, and if so, is that a reason for not backing the cycle mode? In urban environments, the non-user benefits of cycling can be large (as Amsterdam and Cambridge demonstrate). Bicycles outperform motorised public transport in terms of roadspace utilisation, noise, greenhouse gases, and air quality. […] at the Edgbaston District committee Coun Deirdre Alden (Con, Edgbaston) said she was concerned that such a large amount of effort and investment was being spent on a mode of transport predominantly used by young men. She added that, while there were exceptions, “most elderly people are not going to cycle, and it would be dangerous for them to start on our streets now”. The councillor said disabled people did not benefit from cycling and that “women of any ethnic group who wish to wear modest clothing, and I count myself in that category, are not going to cycle. It is a discriminatory form of transport”. And Coun John Alden (Con, Harborne) argued cyclists should be licensed and insured like motorists are if they wished to use the road. Bicycle-enabled public transport can offer advantages to travellers (including motorists) and wider society, so it’s disappointing that aspiration, policy, and action are so badly attuned. In the West Midlands, millions of pounds have been spent on park and ride by transport authority Centro, but almost nothing on bicycle-enabled transit. Outside of London, Britain’s local public transport is dominated by buses, on which the facility to transport bikes is effectively non-existent. 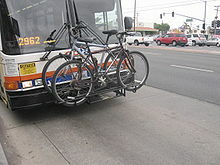 Some cities in the United States allow pushbikes to be transported on local buses, generally by means of a rack mounted externally on the vehicle front. For various reasons, this arrangement is not well suited to the British environment. However, enablement of combined bicycle-and-public-transport journeys should be a priority in urban planning. For city neighbourhoods not served by rail transit, consideration should be given to using large capacity buses, similar to TfL’s New Bus for London, to allow 1 – 2 bikes to be taken onboard. Objections to carrying bikes on transit are usually about capacity or safety. Even nominally ‘high capacity’ rail transit systems can have total or near-total prohibition of cycle carriage. Sometimes, folding bikes are allowed, but these are less affordable for many people. On Manchester’s Metrolink tramway, concern about bikes becoming projectiles in an accident led to transport authority GMITA (now TfGM) turning down requests for onboard cycle carriage. And in the West Midlands, Centro has stated that new supposedly ‘high capacity’ CAF trams will not be carrying bikes. Conversion of railway to tramway has actually reduced green transport options, as can be seen with Metrolink in Oldham. In future British urban rail systems, the facility to carry accompanied bicycles should be designed-in (as with wheelchairs and pushchairs). Many prospective mixed journeys only require bicycle use at one end, and for these, cycle stowage at the transit boarding point should be ideal. However, where bicycle parking has been provided, it has tended not to be very good. The ‘facility’ at Stechford railway station is an example. It consists of two Sheffield stands, in the open air, at the foot of a flight of steps, insecurely si(gh)ted, with no closed circuit tv coverage. Why public authorities choose to have infrastructure designed by non-cycling non-public-transport users, is unfathomable.